Celebrate the joy of giving this season at the Storrs Library. Once again the Storrs Library is sponsoring a Giving Tree to benefit the Gray House, a human services agency located in the North End of Springfield. Anyone can participate by choosing an ornament from the tree located in the library’s lobby area. Each ornament, listing a toy requested by a child, is replaced by a heart ornament with the toy donor’s name on it. All toys must be purchased and brought unwrapped to the Philip Michael Lauro Discovery Room at the Storrs Library, 693 Longmeadow St., Longmeadow, by December 12 for delivery to the Gray House. Did you know that a visit to the library may save you money this holiday season? Before you brave the malls or log on to do your holiday shopping, come to the library. 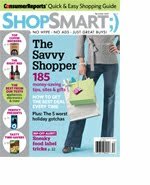 Spend a few minutes in the periodical room and check out Shop Smart for ideas to get the best value on your purchases. The December issue includes 24 shopping secrets that can save hundreds of dollars, and 16 great websites for holiday gifts under $50.00. Looking for safe, age-appropriate children's toys? Don't rely on the packaging--last year more than 25 million toys were recalled, many because of lead. Shop Smart suggests four safety strategies that will ensure you don't purchase an unsuitable toy. Food and wine purchases are covered as well, with several top chardonnays in the $10.00-$12.00 range a bottle. Consumer Reports, the "bible" of savvy shoppers, publishes a special issue every December. It is a handy one-stop source for making intelligent, informed, money-saving purchases. This year the editors have added a Comparing Retailers section. In it, Consumer Reports staff discusses buying trends and presents useful information on service, selection and prices found at dozens of retailers selling appliances, computers and many other electronic products. Holiday preparations are featured in many other periodicals as well. Martha Stewart Living's December issue is full of ideas for elegant home entertaining and decorating. Real Simple caters to more casual hosts as do Better Homes and Gardens and Bon Appetit. And the library itself uses the holiday season to showcase it extensive collection of beautiful cookbooks with a special display in the lobby. So, whether you need help and advice on smart shopping or ideas for creative entertaining, come to the library this holiday season.